Baked jalapeno peppers are easy, delicious appetizer and perfect for snacks. This recipe is healthy alternative to the fried version. It goes well with Pizza & good to try during weekend for family get together’. Bowl 1: combine powdered cornflakes, garlic powder together. Bowl 2: combine plain flour, corn flour add in milk 1tbsp at a time until a dropping consistency batter is formed. Bowl 3: combine mozzarella cheese, cumin powder. Spread 1tbsp cheese spread from bowl 3 to each half of the jalapenos. Dip the stuffed jalapenos in bowl2 (Batter) and then roll it in the crumbs (Bowl 1). Repeat this process again (dip again in the batter and roll in the bread crumbs) so doing it twice helps even coating. Then place the coated jalapenos on the baking tray and bake it for 25-30mins / until golden brown. • You can even deep fry it but it adds more calorie to your dish. Posted on October 4, 2014, in Appetizers, International and tagged Chitras healthy kitchen, drchdietfood, Italian meal ideas, Italian starter recipes; Italian recipes. Bookmark the permalink. 57 Comments. Thanx Cindy. ..have a fab weekend. .. Perfect for the party we are attending tonight! Thanks Chitra! Great snack or appetizer. They look delicious, crunchy on the outside and soft and gooey on the inside YUMMY!! Oh my Gosh, for me that bites are too spicy! 😀 I even cant imagine how I could eat it; but looks really good! Oh my goodness, I love jalapenos! 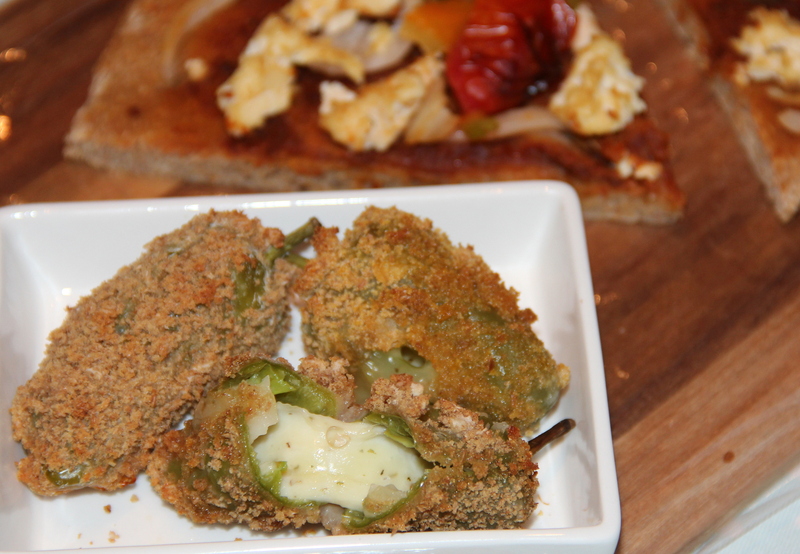 Jalapeno poppers, parrot eggs, or just plain stuffed jalapenos, call them whatever you like. I am a sucker for them and know that frying them is bad for me. This easy recipe is a healthy substitution. Don’t forget to wear gloves when working with peppers due to the oils that can burn your skin and eyes. Thank you Chitra for this recipe post! yes I even wrote to wholesalers to motivate them to import some of this stuff, but no luck so far.. Sounds great dish Chitra!!!!!! !…….I will try when I buy Oven ! !